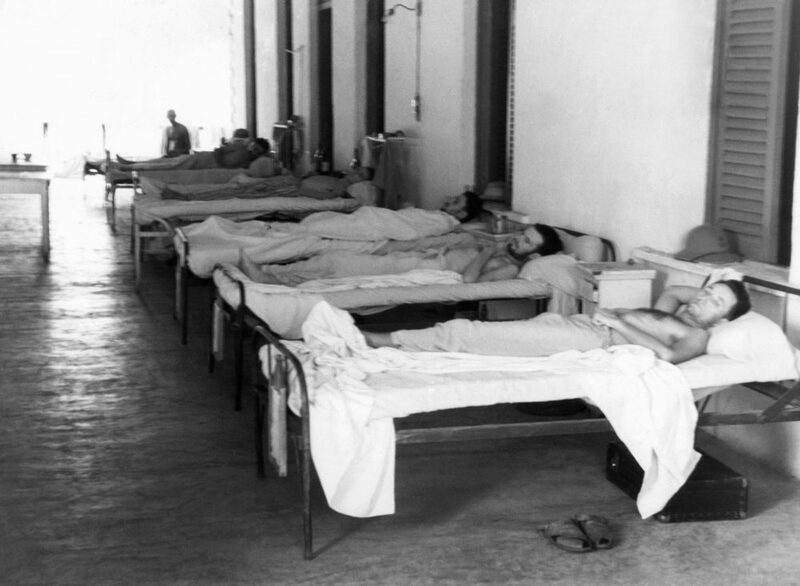 A hospital ward with European and native patients suffering from scurvy and lack of vitamins in Africa during World War II. Photo courtesy of Associated Press. Then scurvy would break out—as it has recently in a mental hospital in Bulawayo, Zimbabwe, and at a clinic for diabetics in Sydney—with typical lesions on the skin and mucous tissue, aching joints, and various kinds of vascular damage. Once this happens, vitamin C (ascorbate) has to be ingested immediately to prevent sustained damage to the bones, the blood vessels, the network of nerves, and the brain. Teeth fall out, cartilage disappears, and internal bleeding begins. The heart is under pressure, and the brain can start to hemorrhage. At the same time, scurvy sufferers experience either stupor or powerful dreams and hallucinations. Untreated, scurvy will kill you. The story of our mutated gene bears strong similarities to the Biblical account of the fall of man, with one important difference. Fruit then was the cause of original sin and our mortality, and fruit (lemons and oranges) now is what infallibly will cure scurvy. But in both scenarios choice of food is a life and death issue. “Govern well thy appetite, lest sin/ Surprise thee, and her black attendant Death,” Raphael warms Adam in Milton’s Paradise Lost, first published in 1667. Hooke’s optimism about human ingenuity didn’t blind him to the fact that we all carry in our bodies the seed of mortality, of which that mutated gene is the physical specimen and scurvy, the specific proof. From Hooke’s era to ours, the biological defect we share with guinea pigs and fruit bats has been a constant in our lives, and for much of that time we have been ignorant of what we need to make us whole. We are none of us perfect, being unable to extract from otherwise nourishing food the vital principle without which we shall die: fat, protein, carbohydrate, and sugar don’t contain it, neither do preserved fruits or boiled vegetables. Like goiter and rickets, scurvy is a nutritional disease. You don’t catch it, like Ebola or bubonic plague. It waits for an interruption in the ingestion of fresh food, and then—if the interruption is long enough—makes its fatal appearance. On hearing that she had scurvy last year, a patient in the Sydney clinic for diabetics, with a scorbutic ulcer on her leg cried out, “I didn’t realize you could be obese and malnourished at the same time.” A lot of people don’t realize this, which explains why scurvy will always be with us. A survey of college students in North America found 14 percent with ascorbate below the level for good health. In the Sydney clinic where the outbreak of scurvy occurred, 60 percent of the target group was in a more dire state of depletion. Amnesia about our peculiar gene isn’t limited to people who choose to eat badly. According to The Guardian, since the onset of austerity economics in Britain five years ago, “the number of bed days accounted for by someone with a primary or secondary diagnosis of malnutrition,” including many elderly people, has risen 44 percent. The biological defect we share with guinea pigs and fruit bats has been a constant in our lives, and for much of that time we have been ignorant of what we need to make us whole. There is however another reason why alertness or indifference to the dangers of scurvy is part of our history. The difference between neo-Platonic and empirical beliefs about the perfection of the human entity was exhibited when Hooke started inventing machines designed to supplement the deficiencies of the senses. He designed microscopes for the eye, hygrometers (to measure moisture) for the nose, a sort of telegraph for the ear. John Locke, the Enlightenment philosopher, was incredulous: Why be dazzled, suffocated, and deafened by impressions our nature was never intended to feel? Hooke thought we needed the supplement of machines if we were ever to feel things as they truly are, and shed our sin and mortality. Locke, on the other hand, was an empiricist to the extent he believed that all we know comes to us via the senses, but like Descartes and Plato he believed we needed no additional help in order for our perceptions to be perfect—or as perfect as was consistent with God’s will. His empiricism was flexible enough to accommodate Plato’s and Descartes’ belief that truly good and wise humans are never in a state of becoming, but already complete in their faculties unless seduced and enslaved by false representations. Margaret Cavendish, the 17th century English aristocrat and scientist, was of the same opinion and, later, so was Locke’s pupil, the elegant philosopher-earl Anthony Ashley Cooper, Lord Shaftesbury. Hooke thought we needed all the prostheses we could lay our hands on if we were to regain what we lost in Paradise; so he ably abetted his friend, Robert Boyle, in the management of an air-pump, a sort of artificial lung, in his efforts to discover the vital principle of air. And Hooke’s colleagues Thomas Willis and Walter Charleton, two great 17th century specialists on scurvy, came as close as any scientists, before the isolation of vitamin C in 1933, to the secret of the vital principle of food. They called it a nitrous salt, a latex, a nutritive sap which, they showed, directly affected the efficiency of the nerves as well as the scaffolding of the body. They knew it added nothing to body mass, but that without it even the most robust constitution would fail. Almost a hundred years after their hypotheses were confirmed by bio-chemical proofs, a significant fraction of the population remains at risk of diseases that supervene when ascorbate levels are low—a risk that can in many cases be minimized with a healthy dose of vitamin C. It has recently been discovered that large intravenous injections of vitamin C will reduce deaths from sepsis by three-quarters. Current research at Vanderbilt University indicates that seizures are much more likely when the body is carrying insufficient ascorbate. A colleague assured me that five years of his life were lost to chronic fatigue syndrome until he started intensive doses of vitamin C.
It is not for nothing that the first outbreak of scurvy in Australia in almost 200 years occurred at a clinic for diabetics. Type 2 diabetes is largely caused by a poor diet cooperating with oxidative stress, a major factor in depleting reserves of ascorbate. Is it because we thought we were perfect that scorbutic imperfection dogs us? Or is it that artificial perfection is too tedious to attain, and we would rather dally with our sin? Jonathan Lamb is the Andrew W. Mellon Professor of the Humanities at Vanderbilt University and author of Scurvy: The Disease of Discovery.